Brendan Connell, Miss Homicide Plays the Flute. Eibonvale Press, 2013. Pp. 176. ISBN 978-1-90-81252-2-4. £8.99. This strange little title is the eighth book published by prolific and acclaimed author Brendan Connell, in a typically high quality and quirkily packaged edition by Eibonvale Press. To all intents and purposes this is a crime novel, featuring a sociopathic assassin, art thefts, family feuds and sexual transgression, but it is so full of experimental features, nonlinear digressions, dreamlike descriptions and rambling, pedantic detail that I suspect it rather thinks of itself as "literary" in genre. The protagonist is a female assassin with expensive tastes, an obsession with music, a master of disguise and poisons, a seductress and cold-hearted killer, pretty much your classic femme fatale. Nevertheless Connell manages to subvert pretty much every cliché in the book (and for such a small book, he sure does have a lot of them to subvert). Sometimes hard to read, especially when lists of classical citations and cultural references are not even disguised in the form of running prose, this novel is almost painfully self-aware, but nevertheless, and despite unappealing characters, keeps the pages turning to see how the story ends. It's a complicated, highly crafted book, not without flaws, but also not without that spark of genius that dares to take this sort of a risk. The protagonist, Serena, pretty much the only character who we see inside the head of, plays at least four roles in the course of the novel, and so thoroughly disguises her appearance, nationality, class and even age that her personality shifts with the roles. Or perhaps it is that her own personality is so shallow, so sociopathic that it is only when playing a role that she has the semblance of a real person (even her day job, as a classical concert flautist, is a costume she wears and a persona she assumes). None of these facets of Serena are in any way appealing, which is the first way in which Connell subverts the cliché of the crime genre in which the heartless assassin is such a classy, glamorous, exciting character that her illegal and downright immoral profession is forgiven by the admiring reader. Not so Serena: her tastes are too bizarre, her methods so unnecessarily cruel, her motivations so shallow and bourgois that she's not even a satisfying anti-hero. Not that there are any characters much more appealing to set against her; everyone else is either even more repugnant and unglamorous, or too weak and pathetic for the reader to root for for very long. The couple of occasions when Serena nearly comes a-cropper, we hope she'll succeed only because the alternative in each case is even worse. This may all sound rather nihilistic and boring, but I don't think it's either of those things; rather it's a very self-aware subversion of the crime genre, part of what makes this intriguing and memorable. Several themes recur throughout the novel, both in the action and dialogue, and in the short and experimental digressions that crop up from time to time. 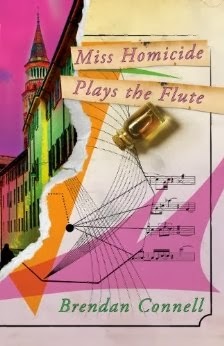 The first and most prevalent is references to music, especially to the flute, but also to other instruments, players, historical styles and musical genres. This interest is not surprising since the protagonist is a career concert flautist, and her other professional interest, the art of killing, is the second major theme. Alongside lists of historical musicians, antique musical instruments, anecdotes from classical composers and artists, and citations from Greco-Roman antiquity (these sections of the book are thoroughly footnoted, showing the research that Connell has put into the subject), are equally pedantic and comprehensive references to killing, to simples and poisons, to unusual murders from history both ancient and modern. The detail is impressive, but sometimes feels as unnecessarily recherché as the more tedious lists in Wilde or Susskind; additionally the lists often begin in the context of prose passages, if slightly stream-of-consciousness ones, but peter out into lists without punctuation or self-restraint, almost as if the author's preliminary notes were just transcribed onto the page with no attempt at communication with the reader. These may be ironic or self-aware traits, prose-poetic or postmodern conceits, but they're a little baffling. Gender politics play a quite explicit role in several passages of this novel. The narrative recognises Serena's frustration at predatory and lascivious men, at the double standard that means women should not encourage attention but should not make a fuss when it is unwanted, at the daily microagressions and more serious career damage faced in a chauvinistic society. We see men objectifying women at every turn; we see anger and jealousy translated into fantasies of sexual assault. Another character bemoans and is stifled by the cultural dimorphism that makes older women less attractive, less acceptable for them to remain sexually active or interested. But these recognitions, while perhaps showing an awareness of feminist issues, lead to Serena's misanthropy bordering on misandry, to disproportionate violence in all cases of abuse, to the older woman being portrayed as grotesque, pathetic and ultimately both morally and physically repulsive. This is not a text that honours or empowers women. The somewhat unexpected, and rather inexplicable ending to this story, not a tacked-on afterword but the climax of a subplot that has woven throughout the piece, perhaps serves to highlight Serena's immorality, and even more than this her complete vacuum not only of human judgement but also of aesthetic taste or any appeal to the reader. If this is a story of alienation, of the corrupt and hypocritical rich, of a world so distanced from our own that we shouldn't even idolize or glamorize it, then it finishes with an unmistakably successful coup de poing in this direction. Which kind of sums up Connell's vicious little novel for me; I did not enjoy reading it, and I don't expect to be tempted to pick it up again, but I can't deny the masterful writing, research, storytelling and sheer craftsmanship that this book contains. I felt the same about Dorian Gray and Perfume, and those are indubitably works of genius. If the words "experimental", "pedantic" and "literary" in the first paragraph of this review didn't put you off, then you'll probably be very impressed by the quality of Miss Homicide Plays the Flute, and recognise, as I do, the exquisite craft that Connell has put into it.